We are in Boulder, Colorado this weekend so Michelle can attend a workshop. Today Sammy and I hiked trails in and around Chautauqua Park. We started with the Chautauqua trail, then the Flatirons loop, Royal Arch, Mesa, Woods Quarry, and Enchanted Mesa back towards town. The trail up to Royal Arch is short but steep. It reminds me of the steep portion of the Section 16 trail in Colorado Springs. This is a popular area with many hikers. Dogs must stay on leash unless they have a green tag issued through some city program. The trails are well-signed throughout the area. The day started out sunny, but clouds and colder temperatures arrived around 11:30. It had started to snow by the time we made it back to town. Other highlights of our weekend in Boulder include Friday dinner at Leaf. Leaf is next door to Aji and shares a kitchen. So, our table was actually at Aji but we ordered from the Leaf menu. We had breakfast at Snooze, and Saturday dinner takeout from Mountain Sun Pub. All of these restaurants were very good and within one block of the little place we rented for the weekend. Update: On Sunday, we had dinners from Shine. The next time I am back in Boulder, I would like to hike trails on the west side of Green Mountain, and go back to Shine to try one of their “potion” or “elixr” drinks. This was our first winter hike in the mountains this season. (What have I been doing?) We had a good time on one of my favorite trails. From the 4-way parking lot in North Cheyenne Canyon Park, we hiked up Gold Camp Road, Seven Bridges trail (622) to Jones Park, then trail 667 west through Jones Park to where it meets trail 701. Our lunch/turnaround spot was about 2/3 of the way to Lake Moraine. I’d like to visit Lake Moriane sometime. That will be a long day–I estimate it will be about an 8 hour round-trip hike from the 4-way. The trails today were in good shape for Winter–not much snow or ice, with no need for gaiters or spikes. We saw about 20 people out on the trail today (not many, but more than I expected). Sammy really enjoyed the snow today, acting like a real “clown”. 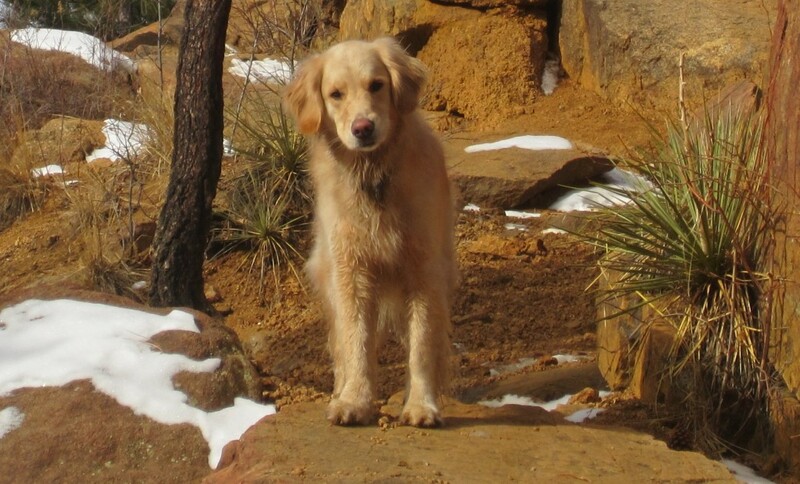 She also met several other friendly golden retrievers. On the return, we hiked around the north side of Mt. Kineo for a little variety. This hike followed the YELLOW line, plus the BLUE addition west.